Almost every wrist-worn fitness tracker now includes a sensor that can track the wearer’s heart rate as another useful fitness metric. But Omron is the first company with a wearable device that can also monitor blood pressure which provides more useful insights into the wearer’s health. That’s not to imply that you shouldn’t seek medical attention when your heart rate soars after simply struggling to open a fridge door, but there’s a good reason why hospitals strap the inflatable cuff of a sphygmomanometer to your arm as soon as you’ve been admitted. Measuring your blood pressure can reveal serious conditions like hypertension or hypotension, but until now the most accurate way to get a reading was using a large inflatable cuff wrapped around a patient’s upper arm. Measuring blood pressure at the wrist is an option, but the Omron Project Zero Wrist Blood Pressure Monitor is the first watch-sized sphygmomanometer that promises readings as accurate as what you’d get from upper arm models. Pricing and availability for the Project Zero is still undetermined as Omron works to complete certification and FDA-testing on the device, but the company claims it will be accurate enough to be certified for use in hospitals and medical facilities. 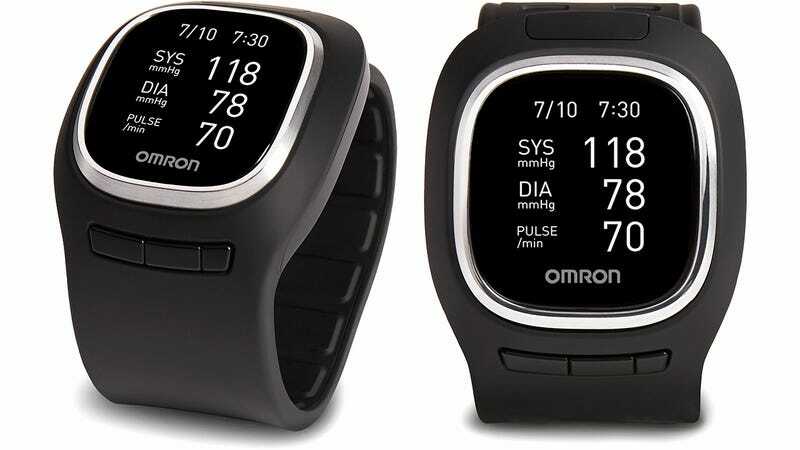 Because Omron uses a miniaturized version of the inflatable cuff found on larger blood pressure monitors, the Project Zero isn’t quite as svelte as a wearable like the Apple Watch, but it can still be worn day and night as a fitness tracker if you don’t mind a little extra bulk on your wrist. In addition to measuring blood pressure, Omron’s over-sized wearable also tracks other fitness metrics like physical activity, or even the quality of your sleep over night. And all of that information can be wirelessly synced with the Omron Connect app, available for iOS or Android devices, allowing users to keep tabs on their health progress over time, or to send health reports to a physician for remote monitoring of a condition. Most fitness enthusiasts probably don’t need to keep tabs on their blood pressure on a minute-by-minute basis, and there’s little doubt the Project Zero Wrist Blood Pressure Monitor will eventually hit the market at a price point higher than most fitness trackers. But compared to the blood pressure monitors that hospitals have to wheel from room to room and patient to patient, the Project Zero will also certainly be a cheaper and more convenient solution for keeping tabs on a patient’s blood pressure. In other words, there will be no shortage of interested buyers for this one.